eBay is more stable and predictable, but MercadoLibre offers superior growth. MercadoLibre (NASDAQ:MELI) is sometimes described as the eBay (NASDAQ:EBAY) of Latin America, and this comparison makes a lot of sense. Not only is eBay a major shareholder in MercadoLibre, with an 18% stake in the company, but the two e-commerce players also have fairly similar business models. On the other hand, there are some important differences in terms of risk and potential for growth. 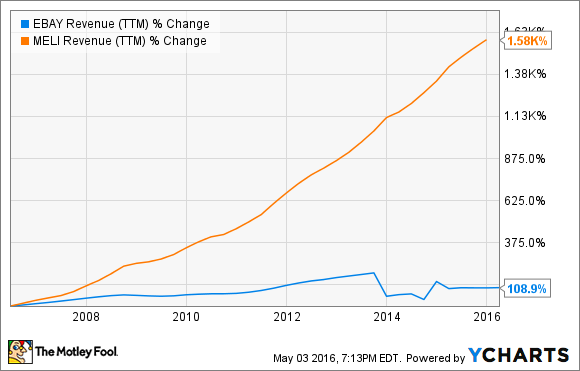 Which one is a better purchase for investors right now: eBay or MercadoLibre? MercadoLibre is the undisputed e-commerce leader in Latin America, and this means extraordinary potential for growth. However, some of its main markets are going through a lot of economic volatility lately, and currency depreciations in Latin America are hurting MercadoLibre's financial performance when translated to U.S. dollars. Brazil, Argentina, and Venezuela are the respective first, second, and fourth markets in terms of overall sales for MercadoLibre, so what happens in these countries has a major impact on the company's financials. There are reasons to believe that Brazil and Venezuela could turn toward more market-oriented policies in the middle term, while Argentina elected a market-friendly government in December. However, even if the political landscape will improve in the coming years, economic transitions take time and effort, and it's hard to tell how the main economic variables in Latin America will affect MercadoLibre over the coming quarters. eBay makes nearly 57% of sales from international markets, so the company has considerable exposure to foreign currencies, too. Nevertheless, a big part of eBay's international business comes from Europe, where currencies tend to be far more stable versus the U.S. dollar than in Latin America. eBay is also more than 10 times as large as MercadoLibre in terms of revenue. Wall Street analysts are on average forecasting that eBay will make $8.8 billion in revenue during 2016, while MercadoLibre is expected to generate $717.6 million in sales over the same year. Needless to say, size is a major advantage for eBay versus MercadoLibre when it comes to stability and generating predictable financial performance for investors. eBay faces tough competition from Amazon.com (NASDAQ:AMZN) on a global scale, and this is a major limitation when it comes to growth. Amazon is aggressively focused on growing sales and gaining market share in different retail categories, even if it comes at the expense of razor-thin profit margins. Competing against Amazon can be terribly daunting for both online and brick-and-mortar retailers, and this is considerably dragging on eBay. MercadoLibre, on the other hand, doesn't face the same degree of competitive pressure from Amazon, as the company is the top dog in its main markets. According to management, MercadoLibre is the most visited e-commerce site across Mexico, Colombia, Venezuela, Brazil, Peru, Chile, and Argentina. Amazon comes in second position in select markets such as Mexico and Venezuela, but in many other Latin American countries Amazon doesn't even rank among the most popular e-commerce platforms. Economic conditions are far more unstable in Latin America than in the U.S. or Europe, but emerging countries also tend to generate faster economic growth over the long term. Besides the e-commerce industry only accounts for a modest 3% of all retail transactions in the region, so it still offers abundant room for expansion going forward. eBay was separated from PayPal via spinoff in July of last year, and the company lost a powerful growth engine in that separation. MercadoLibre, on the other hand, still has its own digital-payments platform, MercadoPago, which plays a similar role for MercadoLibre to what PayPal used to do for eBay. MercadoPago is not only a popular payment method for transactions inside MercadoLibre's marketplace, but it's also growing outside MercadoLibre and becoming a promising business opportunity on its own merits. MercadoLibre doesn't face as much competition from Amazon as eBay, and the e-commerce industry in Latin America is remarkably attractive on a long-term basis. The company also has a powerful growth engine in MercadoPago. With this in mind, it's really no wonder that MercadoLibre has substantially outgrown eBay over the past decade in spite of currency headwinds, and this will probably remain the case in the future. If you're willing to tolerate higher economic uncertainty in exchange for superior potential for growth over the long term, then MercadoLibre looks like a better play than eBay.